It’s really hard, especially in the summertime, to come up with side dishes with a Mexican flavor that aren’t heavy on the carbs (beans, rice, corn, etc.). I had to search high and low for this one (and finally found it on my own Recipes I Want to Try board on Pinterest). Cut the top/stem and very bottom point off of the jalapeno, then cut it into quarters lengthwise. Using the paring knife, carefully remove the seeds/white membranes (this is where the heat resides in the pepper, so if you want more heat, leave more of the white membrane in tact). After seeding, slice the pieces lengthwise into thin strips, then chop these into fine pieces. Put in plastic storage bowl. Add garlic, lime juice, red pepper, salt, black pepper, and olive oil to container (start with 1.5 tablespoons of the lime juice and olive oil—use additional only after the recipe is finished and you’ve had time to taste it). Seal lid tightly and shake vigorously until all ingredients are well combined. Using a very sharp knife or mandoline, carefully slice the cucumber into thin, flexible slices. My mandoline doesn’t have an adjustable blade, so I wasn’t able to get mine as thin as I wanted (the recipe I used showed theirs as being almost transparent, they were so thin), but it still worked. If you want to skin your cucumber before doing this, feel free. 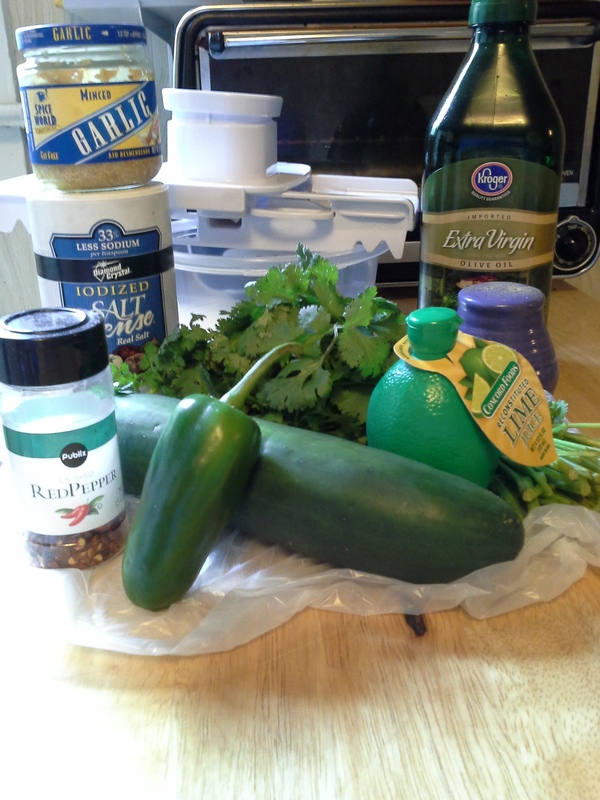 Add cucumbers to dressing in the plastic container. Cut off the bare stems of the cilantro. Then, bunching the leaves together as much as possible, finely chop the cilantro until you have approximately 2 tablespoons. (I didn’t get mine chopped as finely as I should have. I’ll try harder next time.) Add cilantro to container with other ingredients. Seal the container and shake vigorously (turn it upside down several times, too) to make sure all cucumber pieces are coated with the dressing. Taste and add more seasonings/lime juice/olive oil at this point if desired. I found it needed more lime juice, salt, and heat. So I added another tablespoon or so of lime juice and several generous shakes of Tony’s More Spice. Let sit in the fridge at least 30 minutes if not several hours. 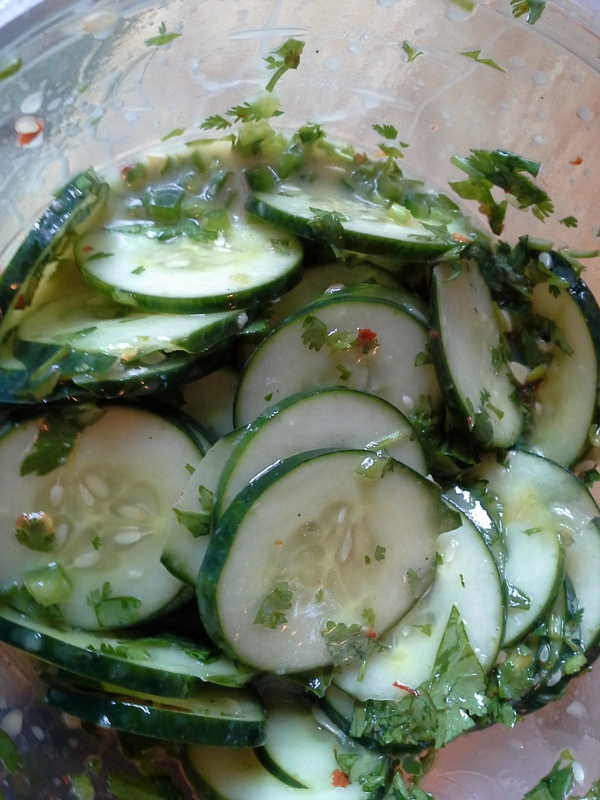 The longer it marinates, the more flavor the cucumbers absorb. Let sit out at room temperature at least 30 minutes before serving.